Beautifully updated home on a quiet cul-de-sac, MOVE IN READY! Notice the curb appeal as you head towards the covered front porch. You'll love the newly finished real hardwood floors throughout much of the main level & steps, FRESHLY PAINTED THROUGHOUT, ample dining area adjacent to the living room, large kitchen with refrigerator, dishwasher, electric cooktop, in wall oven, ceramic floors, ceramic backsplash & more! Walk out to the upper deck, perfect for grillin' & chillin' plus overlooks the beautiful large backyard. 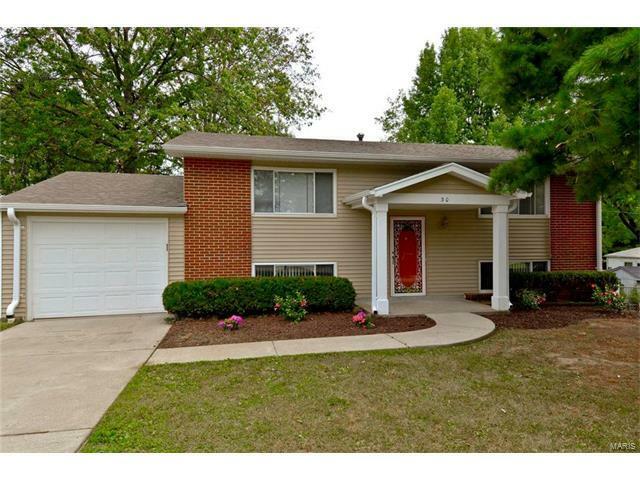 Updated full bath in center hall & two nice sized bedrooms upstairs, each with double door closets for lots of storage. Downstairs you will find NEW CARPET, huge family room with walk out to the patio and lovely level backyard, also a large third bedroom and second full bath, perfect for the growing family OR for out of town quests. Park out of the weather in the attached garage & enjoy your well kept cul-de-sac. Great location to major highways & shopping. HURRY!! Dorsett to N on McKelvey to left on Glenpark to right on Glenpark Ct.